The OoPS virus is a new ransomware threat that contains a built-in encryption engine. It encrypts sensitive user and system data and renames all affected files are packed in an archive with the .ramen extension. Victims can follow our complete removal guide to learn how to restore their computers and data. How Does OoPS File Virus Infiltrate the System? The OoPS virus infiltrates victim computers using different methods. Depending on the initiated attack campaign by the criminals behind the malware, different strategies can be used. One of them is the use of email spam messages. The criminals create and coordinate large-scale attack waves against potential victims by sending messages that employ different social engineering tricks. Their contents contain text, images and other elements that make it appear as being sent by legitimate companies or even government agencies. The OoPS virus can be delivered as an attachment or the payload can be linked as an infected office document or malicious software installers. Computer criminals often distribute viruses by means of scripts included in dangerous office documents. They appear as legitimate invoices, letters or other files of user interest. Once the victims opens them a prompt appears that asks for permission to execute them. If this is done then the OoPS virus payload is downloaded from a hacker-controlled download site and executed on the local machine. Infected software bundles are another possible source of infections. The hackers download free or trial versions of popular software and modify them to include the OoPS virus. They are then distributed on hacked or hacker-controlled download sites and P2P networks. As the files are distributed in a single binary executable file it is very easy for other infection methods to be employed as well. Such include browser hijackers, hacker-designed addons made for the most popular web browsers: Mozilla Firefox, Safari, Microsoft Edge, Internet Explorer and Google Chrome. They not only change important settings (default home page, search engine and new tabs page), but also harvest sensitive information: cookies, stored passwords, account credentials, cookies, bookmarks and history sessions. Redirects and built-in functions can download the OoPS virus to the infected machines. The computer hackers can also opt to directly target whole networks of potential targets using automated software. 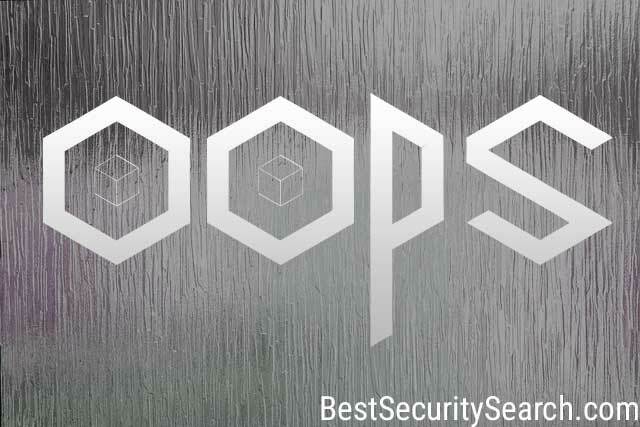 They seek to find a vulnerability in outdated applications that can be exploited to gain entry to the machines and infect them with the OoPS virus. The OoPS virus is a newly discovered malware that does not bear a resemblance to any of the famous malware families. We believe that this is the work of an independent hacker or a hacker collective as there are no signatures or leads that link it to any of the detected threats so far. All processed files are placed in an archive with the .ramen extension. The affected files are of various types: archives, music, videos, photos, documents and etc. The majority of the file viruses (ransomware) encrypt all files individually and assign an extension to mark the processed files. The OoPS virus does thing in a different way by first archiving the compromised data and then renaming them. The use of the AES-256 cipher makes it impossible for the victims to restore their computers without the use of a professional anti-spyware solution and data recovery software. WARNING! Manual removal of OoPS File Virus requires being familiar with system files and registries. Removing important data accidentally can lead to permanent system damage. If you don’t feel comfortable with manual instructions, download a powerful anti-malware tool that will scan your system for malware and clean it safely for you.